...each of these steps are notes that are named - C D E F G A B C. Note that you see eight letters but just remember there are only 7 because the first note and last note are the same. Well, in between all but two of the white keys, there is a black key. And from a black key to a white key and visa versa, is called a half-step interval - interval meaning distance between those two notes. 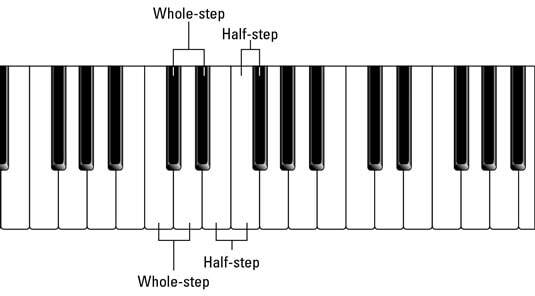 So, from a white key to a white key and/or a black key to black key is whole step - or what is also called a whole step and a whole tone. 1/2 + 1/2 = 1 - a whole tone! I could go deeper (Minor scales, modes, triads, chords, chord progressions, etc.) but let's not... if you understand the whole steps - even if just a little - that is enough. If you don't, then any more explanation won't help anyway. It is a fascinating language to understand though - and it is very simple, actually. I love it! (that and KJB English!!!). Learn to play piano and you can learn everything about music. However, if we were to play everything in whole steps, then we have the Oriental / Eastern sound. And, of course you have heard me warn about being replenished from the east, right? ...because they be replenished from3 the east, and are soothsayers like the Philistines, and they please themselves in the children of strangers. Isaiah 2:6. It wasn't a good thing when the Jews did it, and it isn't a good thing now that the Gentiles are doing it. We learn from history that we don't learn from history, right? So this seven whole-tone thing is nothing but Eastern mystic sound that God hates, according to Amos 5,6 - and he didn't want to hear the sound of their viols then and He certainly doesn't want to hear the sounds of today's modern music, either - mainly the beat from Africa today because it appeals to the flesh nor is He pleased with the mystic sounds from the east today because it plays with the spirit of man, it rejects, quenches and grieves the Spirit of God today. There is a power in music, no doubt. It can be a manipulator, it can be a mood creator, it can make people respond in various ways - some good and some bad. It most certainly is the universal language. All people, all languages, all countries, etc. respond to it whether they understand it or not. But it isn't how God works - He works through His words - ONLY! He works through the King James Bible - NOT through music. God doesn't work through emotions, through the flesh, etc. and that is how music works. Man can either use music for God or against God. When one realizes how the devil has done to music, is doing with music today and especially how he WILL be using music in the near future, you will much easier see what is going on with music today not only in the homes and ears of the people, but in the churches, as well. See Daniel chapter 3 for some prophetic thought.